Here’s my middle aged hippie/rocker husband with a mullet/ponytail. How in the world does he get away with that ‘do in the Army? Last night, Bill and I loitered over our dinner. Most of the kids had excused themselves, but then there were the hangers-on…the ones who suspect that something monumental might be discussed and they wouldn’t want to miss it. Or perhaps they just enjoy our company so much, that they can’t bear to go into another room. Jenny was climbing all over Bill, and behind him. She was making rabbit ears and other annoying gestures which he couldn’t see, and which did not amuse me (her audience) in the slightest. But when she crouched behind him and spread her hair over his shoulders, I nearly fell off my chair. I much prefer the high-and-tight cut. 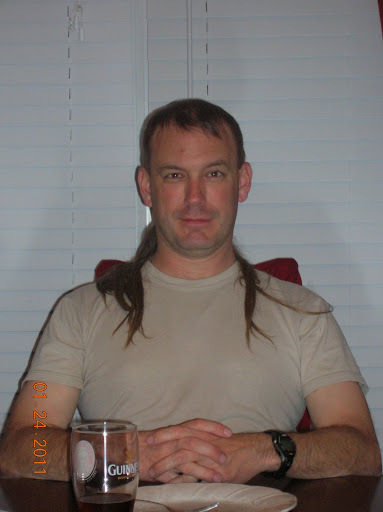 That's one thing I love about having an Army husband – he'll never have a shaggy sloppy haircut. Now I just need to learn how to give a high and tight haircut so we can stop paying a barber.